The Church of Saint Francis is a splendid building, and not quite what you expect to find in the centre of an inter-war housing estate. Think it's big outside? Well it's like a Tardis inside! The grand brickwork building, faced in stone, was consecrated in 1941. Prior to that, from about 1929 the area was served by a small wooden mission church for both religious and social purposes, but the number of activities that took place meant that a permanent Church was needed. The first Parish Priest of Friar Park, Father John Finney, spearheaded the campaign to build the present church; he went off to war as a chaplain, was sadly injured, and never returned to enjoy the building he had brought to birth. At the top of the new steps and ramp, behind the wooden doors on Freeman Road you will find a warm welcome in one of the most beautiful Churches in the Midlands. The building was designed by a Birmingham architectural firm, Harvey and Wicks, built by local builders Dallows, and worked on by Italian prisoners of war. The building has an Italianate feel and the frescos under the arches were hand painted by the prisoners of war. 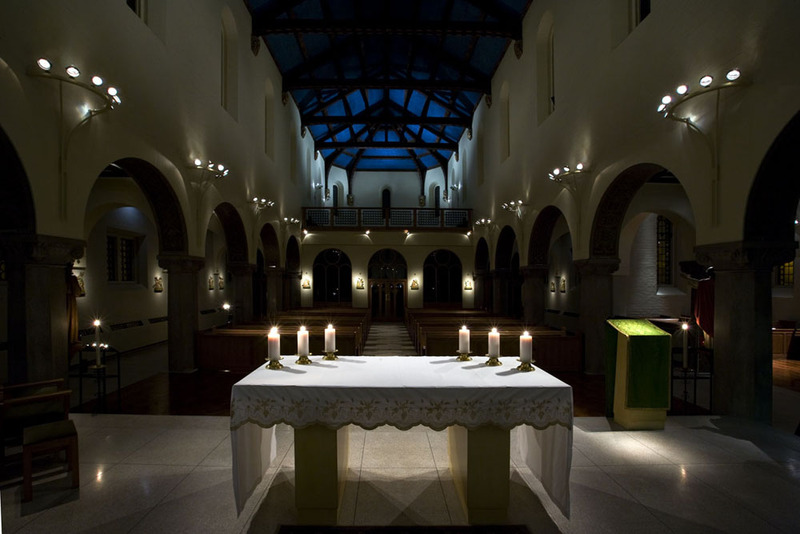 The warm homely feel of the Church makes it a beautiful place to get married in or have your children Christened; many people from Friar Park also choose to use the building for the funerals of their loved ones. 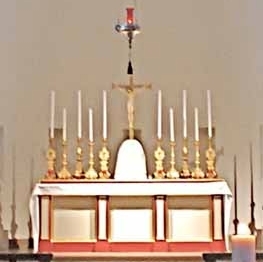 On the High Altar stands the Tabernacle where the Blessed Sacrament of Christ's Body and Blood is reserved for the Communion of the sick and the dying, and for the adoration of the Faithful. The red lamp burning over the Altar is the sign that Jesus is sacramentally present in this church. This was the main Altar of the church until 1979 when a fine new Nave Altar and platform was created to allow a simpler and more accessible style of worship on Sundays. 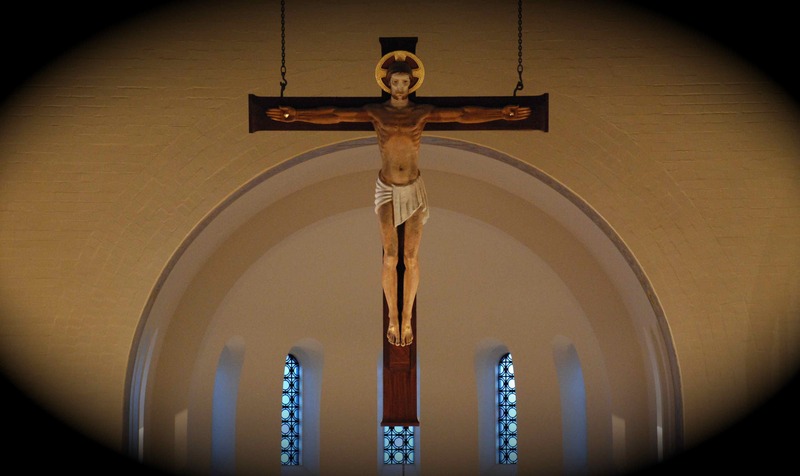 Hanging in front of the entrance to the High Altar is one of the most beautiful crucifixes you will ever see. 1.5 times larger than life, it is an impressive and magnificent expression of the extent of Christ's love for us. The nails in his hands and feet and the expression on His face are powerfully real. On the pillars flanking either side of the choir are the figures of Our Lady Mary and Saint John looking up to Jesus. 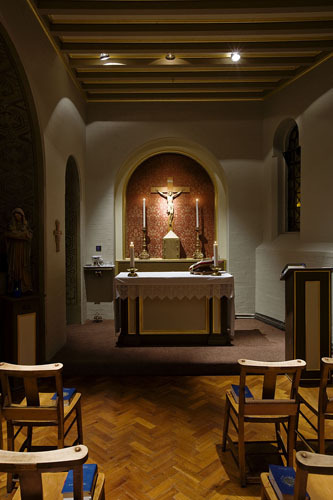 Our weekday Chapel (sometimes called the Saint George's Chapel), where most of our weekday Masses take place, is found to the right of the Nave Altar, and was originally furnished by the Friar Park British Legion in memory of those who laid down their lives in the Great War 1914-18. The Chapel also contains a Book of Remembrance containing the names of residents of Friar Park who paid the supreme sacrifice during World War II. Glassed in from the main church, and with independent heating, this small, beautiful chapel is a peaceful place to pray. The statue is in memory of Harry Roberts, a former organist of Saint Francis'. To the left of the main altar is the Lady Chapel. 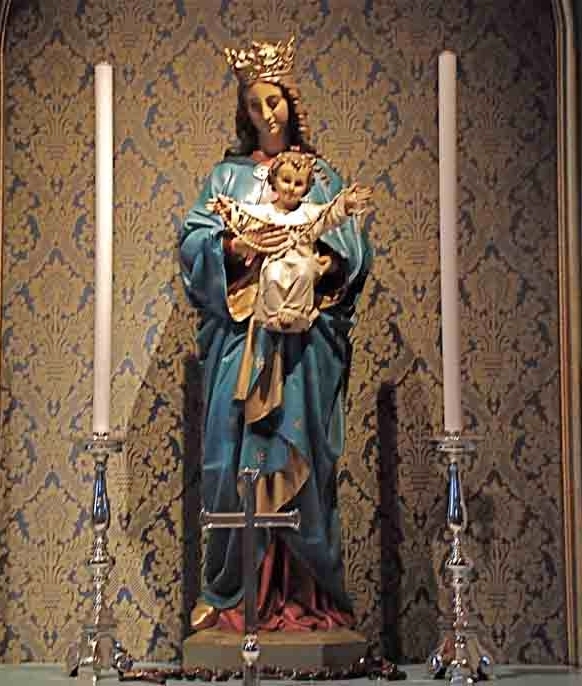 The main statue behind the Altar is of Mary (sometimes called 'Our Lady', hence the title of the chapel - the Lady Chapel) holding her Son, Jesus. The pews were made in 1964 by a famous Yorkshire carpenter called Robert Thompson ('Mousey Thompson') and are in memory of departed members of the congregation; Thompson's trade mark small carved mouse can be found at the bottom of the pews and prayer desks. This chapel is regularly used to say Matins and Evensong. At the rear of the Chapel is a statue of Our Lady of Walsingham, in memory of Miss Betty Pinner, well-known to generations of Friar Park children. 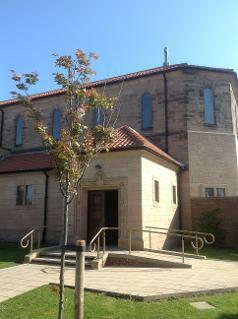 In 1992 the rear of the church was altered radically. Under a new balcony, a community room, separated from the main body of the church by a glazed screen, was formed. There is a small kitchen and a disabled toilet. Because this Narthex (or gathering area) is independent of the church, we use it to accommodate the social events that take place in the course of the year, including meals, quizzes, bingo, and the various celebrations we host. Our Brownie pack and Junior Church meet here as well. 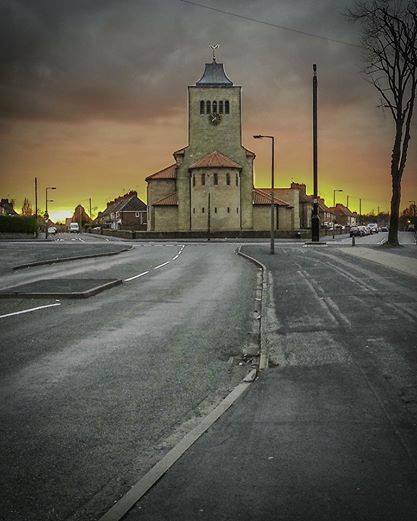 At the Millennium digital church bells were installed and now ring at various times of the day so all can hear that prayer is being offered for Friar Park. 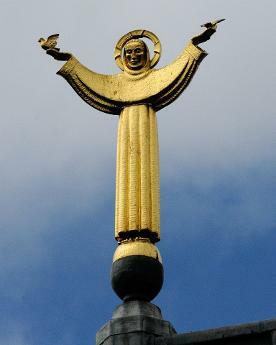 The Church has recently seen major renovation work, including the repair and gilding of the fine statue of Saint Francis at the top of the tower, re-roofing, installation of a new electrical system and sympathetic lighting. We could not have done this without the help of a local church charity, the Walter Stanley Trust. A new heating system makes the church one of the warmest around! All this has beautified our building, and made it fit to continue to spread the word of God. Even now (Spring 2014) renovations are ongoing to the carvings around the doors on Keir Road and Freeman Road. We want the best for God, and we want to offer the best to the community of Friar Park as well ! just to sample its beauty, simplicity, prayerfulness and God's love.